Get ready to shake your tail feathers! 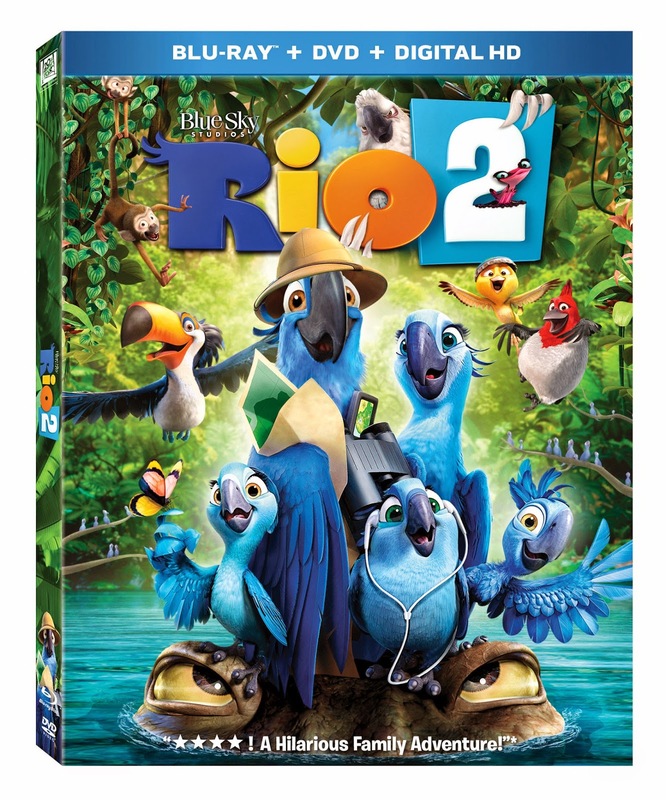 Twentieth Century Fox Home Entertainment takes you deep into the Brazilian Amazon Rainforest for the most fun you’ll have all summer, as RIO 2 debuted on 3D Blu-ray, Blu-ray and DVD July 15. Just in time for summer vacation, this “hilarious family adventure” (Jeff Craig, Sixty Second Preview) will samba its way into your home with exciting bonus features and extras everyone will enjoy. Projected to eclipse more than $490 million worldwide at the box office, the animated hit is the must-own family title of the season. Although this computer animated movie is geared towards kids, I found myself enjoying it as much as my children did. There's a whole cast of characters to like and the colorful scenes were rich and engaging. The only character I didn't care for was Nigel. He had an eerie arrogance and tone to him that didn't fit in with the movie. I wouldn't say that the film was uproaringly funny, but rather charming and cute. The musical selections for the movie were fitting. Having seen the first movie, Rio, I'd say this one was just as good and definitely a movie to watch. Available only at Best Buy, you can buy your Rio 2 fan a limited edition lunchbox. It's an exclusive back to school item that features several Rio 2 characters on the front and sides. That lunch box is cool, and we're headed to town today with Best Buy on the list (I need a camera lens cover). I'm going to look for it! I really enjoyed it, ordered on pre-sale through Amazon.